Detailed description of the 1832 George Catlin Skinwalker painting of the "Medicine Man, Performing His Mysteries over a Dying Man"
What is Skinwalker? There are many legends and myths surrounding the supernatural Skinwalker. 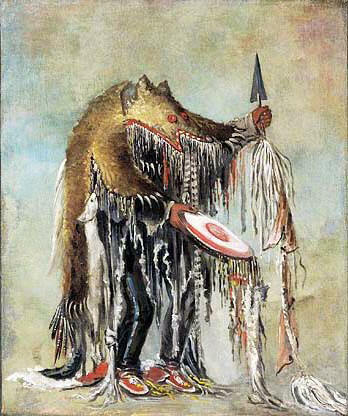 This article refers to the Skinwalker as a medicine man as illustrated in the above 1832 George Catlin Skinwalker painting of a "Medicine Man, Performing His Mysteries over a Dying Man". 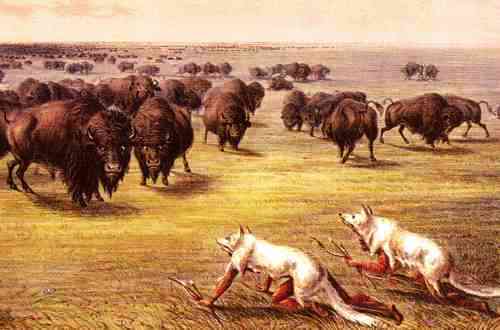 The tradition of the Medicine Man adopting the guise of an animal is believed to have started with the Great Plains Native Indians who used the skins of wolves as camouflage when hunting buffalo, as depicted in the following picture. Skinwalker. Discover the vast selection of pictures which relate to the History and Culture of Native Americans. The pictures show the clothing, War Paint, weapons and decorations of various Native Indian tribes that can be used as a really useful educational history resource for kids and children of all ages. We have included pictures and videos to accompany the main topic of this section - Skinwalker. The videos enable fast access to the images, paintings and pictures together with information and many historical facts. All of the articles and pages can be accessed via the Native Indian Tribes Index - a great educational resource for kids.